The democracy civil society watchdog group in Imo State, Imo Bilie Initiative for Social Justice has officially reacted to the visit of Governor Rochas Okorocha to Chatham house, London. In a press statement signed by the National coordinator and General Secretary of the organization, Comrades Aku Obidinma (Abdul) and Emperor Onyekah respectively and issued to journalists on Friday the 11th of March 2016 in Owerri, the group frowned at the Governor’s visit and described it as an irrelevant pursuit of ego and unmerited fame by a power drunk Governor. 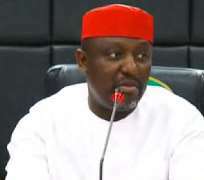 The group expressed worry that this trip has no benefit to the sufferings of Imo people who are currently under severe hardship inflicted on the state by the bad leadership style of the Governor who has concentrated the wealth and resources of the state only in the hands of his family members and friends. It is unbelievable that the Governor would waste our scarce resources on such ego massage at a time when he has ran the state into financial insolvency, resulting to the inability of the government to pay complete salaries of workers and pensioners in a state where the majority of the citizens are workers, the group said. They further accused the Governor of blindly imitating President Mohammed Buhari who addressed Chatham house before becoming the President of Nigeria. The group however condemned Governor Okorocha for failing to follow the President’s method who was invited By Chatham house and also went with less than 10 persons and addressed an international audience while Governor Rochas Okorocha in his characteristic showmanship arranged his visit, went with about 50 people from Nigeria and ended up addressing a hall filled with people from Owerri. The press statement accused the Governor of having the habit of wasting the meager resources of the state on wild goose chase abroad. It recalled that the Governor has twice gone to Turkey with over a hundred people on each visit on a purported investment drive which till date has not attracted a single Turkish investment to Imo state. The group ended by describing the Governor’s trip as a failed image laundering venture aimed at diverting the attention of the public from the current investigation of his government for pocketing 2 billion Naira of the state bailout fund as stated by an EFCC press release which was reported by the media. The group therefore used the statement to reiterate her call on the EFCC to thoroughly and diligently investigate the alleged stealing and prosecute the culprits while charging Ndi Imo to wake up from their slumber and question the activities of the government, since the people deserve the government they have.